The teacher and writer Josep-Francesc Delgado shares his experience as a participant in the educational programme “The art of speaking”. This programme developed by the museum, in collaboration with the Department of Education, began during the last course in an experimental way. The main aim is to improve the oral expression of the students from adult schools through art using VTS techniques (Visual Thinking Strategies). Being a teacher is a job of much self-denial and a lot of commitment. Teachers, like doctors, often only have their minds and hands to encompass a lot of personal, family and social problems of the people they attend. Now, being a teacher also provides you with emotions of an intensity that can’t be beaten. In this article I will explain two of them. I am currently teaching in an adult school in the Bellavista district of Les Franqueses del Vallès. When we celebrated Christmas a few years ago, we taught our Senegalese pupils to do the traditional Catalan Christmas celebration of “cagar el tió”. There was a student who always came to class happy, almost dancing, he weighed one hundred and ten kilos and was almost one metre ninety tall, he was a tower. His eye sockets, very white, and his ivory teeth were very prominent on his dark skin, but what stood out most were his thick and smiling lips, it was a warm smile that reached you, like when a gentle breeze gets up. This person, who always came in happy because he was already able to maintain his wife and two children in Senegal, got up each day at six in the morning and went to collect scrap metal for Barcelona until four o’clock in the afternoon. He made a sandwich and, at quarter past five, he was already in class to learn Catalan, I never dared to ask where he slept because with the intuition I would soon find out. When we did the caga tió, he only asked, with the tone of prayer of someone who prays in church, with the low and delightful voice that is used when nobody sees us and expresses a deep and intimate desire, for the tió to bring some papers to legalize his situation. Coming from a person as joyful as him, that gravity was still more impressive due to all the drama that he suddenly laid bare, for all to see. It seems to me that he had understood the meaning of tió better than me. At the end of the last course his wish came true and he was able to go and see his relatives that he hadn’t been able to do for three years due to the lack of papers, and got to see his little son who he had never seen. This past autumn I once again became a spectator for one of those moments. On June 30, in a series of pedagogical training conferences organized by the Department of Education in the CaixaForum to present the programme “The art of speaking“, we came into contact with a didactic initiative that, to me and my colleague, powerfully caught our attention: Visual Thinking Strategies or Using art to deepen learning. The direction of our centre encouraged us to join it. Montserrat Morales, psychologist and educator made known the existence of this method along with Esther Fuertes, art historian who designs and implements the educational projects of the Museu Nacional d’Art de Catalunya; and it was coordinated by the English teacher Josep M. Planas from the Department of Education of the Generalitat. The idea came from the United States and from the world of museology. In museums, it was found that people were doing hours-long tours in a matter of minutes, not paying attention to works of interest and of undoubted importance, and that worried them. As my student Dolors said, we are living too quickly and we do not even stop to look, or think. Visual Thinking Strategies develop a methodology for looking at a painting for about a quarter of an hour and to understand it based on one’s own emotions. The good thing of the methodology is that it shows that we can all understand a good picture if we look at it attentively, even if we don’t have any knowledge of art history. I was interested because, for years, I was able to lead some students from the third grade of ESO to selectivitat (the university entrance exams) and, fed up with the abstracts and analyzes of the readings, I began to ask them what had moved them and that they made an argument based on their own reader emotions. I had encountered the same problem of acceleration: they went through the lines of the pages too quickly and did not feel what they were reading. Having an effect on the emotions that a literary text reveals to us, those students became good readers and this improved, at least, their marks in the selectivitat in the commentary of an article because their argumentative capacity grew more than with the traditional methodology. Suddenly I found the same strategy based on painting. 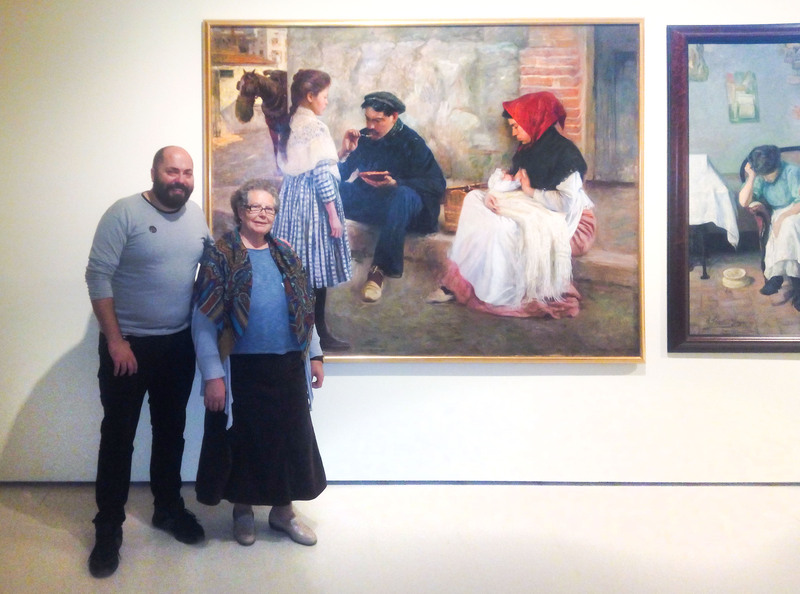 Well, the day arrived to find out if the method worked and on November 20 we were facing the painting The worker’s lunch by Francesc Sardà exhibited in the MNAC. 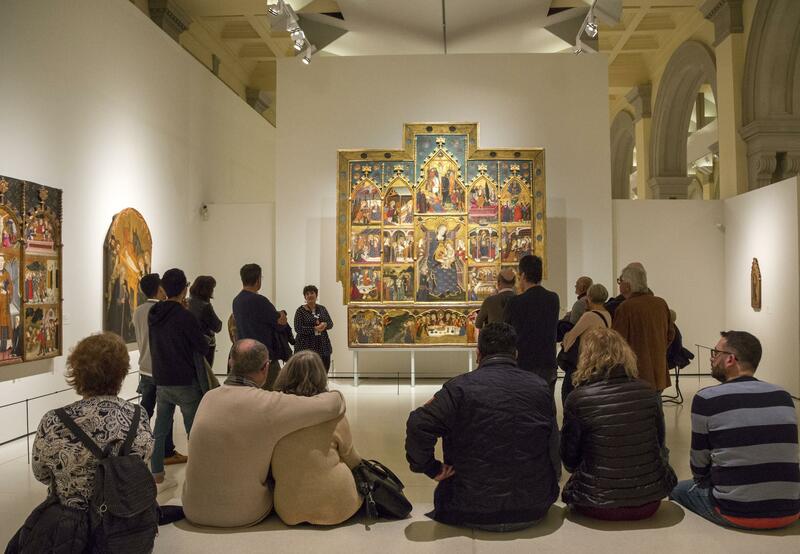 The experience was carried out by my colleague, Lluís Domènech; I say experience because I believe that it is mainly this: an experimentation of painting in an emotional key, which leads to a global understanding. 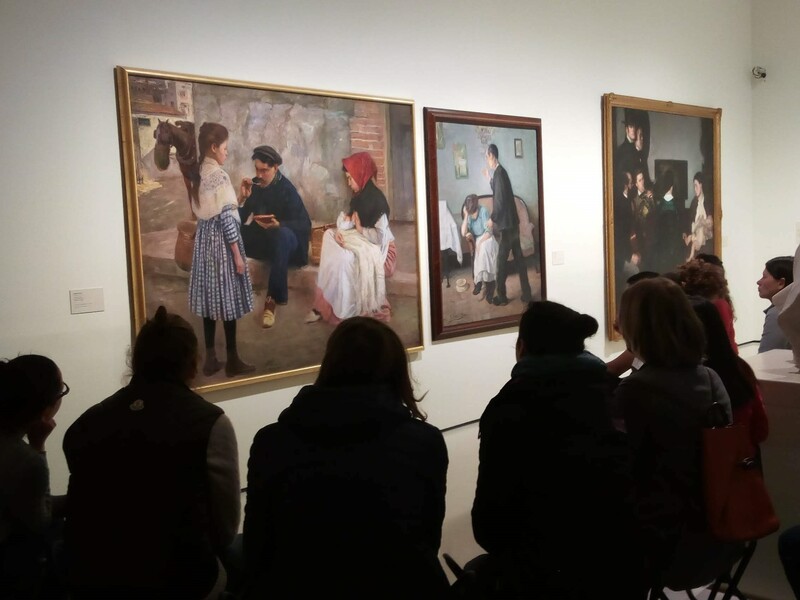 My students: Amy, Àngels, Dolors, Arcadio, Veronica, Catalina, Sònia, Rafael, Ramon etc., made me realize things about the painting that I had completely overlooked. Part of their reflections were focused on justifying how we could realize that two of the three characters in the picture were poorer than the third person. Then Catalina intervened with a very bright emotion in her eyes and said that those people reminded her of her childhood in the shacks of the neighbourhood of La Salut in Barcelona, because that worker was eating his soup sitting on the pavement with a clay dish and an “alpaca” spoon, and that she had eaten with spoons like this when she was small; and had seen those loose shirts of the workers. 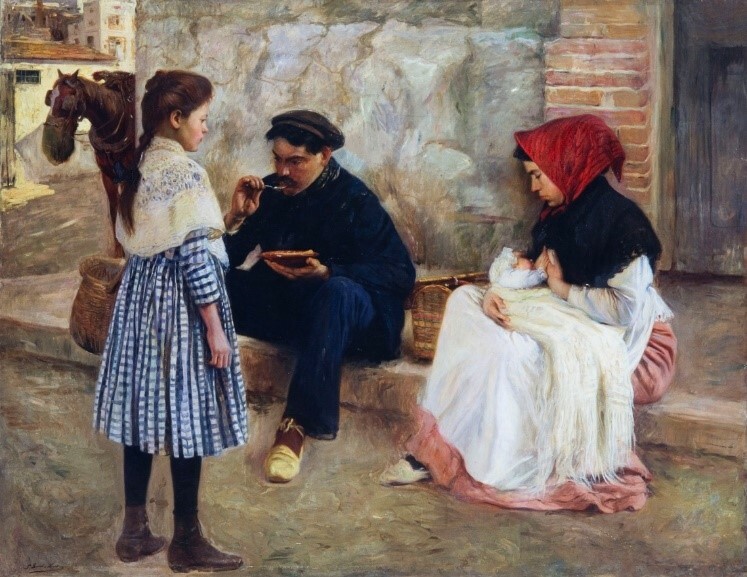 And everyone remained wordless for some seconds, silent; suddenly the aesthetic experience of the painting (it is very well painted) became a real and carnal experience: someone had put a spoon in the mouth like the one which the youngest of the group had never seen. It was as if the canvas had come to life and we were about to hear the sips of the worker eager to eat. We were in a museum that is very impressive, with one of the best artistic legacies of these hundred years, from which we can enjoy all together and, in an instant, the toughest life of Barcelona had appeared with all its strength, that of the shacks or slums from the nineteen fifties. Catalina herself told us that we were not far from those slums of Montjuïc, which is currently a green area. When I was returning home to the train I could not stop thinking about how Catalina must have been when she was small. This country has been made with the silent and selfless work of many people such as that of the lunch of the worker painted by Francesc Sardà and like Catalina; And beneath the gleaming marble that we see now, there is a lot of work from those who have lived between the baked clay of the dish and many spoons of alpaca from those who polished the marble, scratching their elbows until making oil. It had become dark and the train advanced. I could almost see Catalina running between the shacks while her mother prepared the table with one of those spoons that had taken on a life from the painting; and Catalina’s legs ran like those cyclists who charged the dynamo pedalling to illuminate the night on the road. Then she did not know why it was too small, but running around the neighbourhood of La Salut she also charged the dynamo of a country: she built it. This article is a version already published in the newspaper El 9Nou to whom we are very grateful for their collaboration. Interesting, but an artist It is also a worker sometimes. But a especial way of earn money to pay the bills if It achieve this possibility. The diference is that in general, an artist do not feel like working, they feel like playing as a child. Yet , an artist can develop art works that make people reflect about sevetal subjects, their art may help to enchanté the life of someone, may change and move a society, may demanda the improvement of new technologies. Like the art work of Katalina which can make someone think about choices, oppotunities, past costumes, improvement of directs of people in a comunity, bias because art should be seen as an important work . True because there are diferent kind of spoons, even when you beleive your is the hardest onde there are others worst ones . Better in life is to try to make this world a better place wherever is tour job or reality and if you are bit happy everyone has the direct and the power to try to make chances in theirs lives. People not always need to accept what is already there because which onde has a way to look to a problems and each onde will find a different solution or way to solve problems .